In honor of the Thanksgiving month, we’d like to express our gratitude to all of you for being caring advocates for Oregon’s wolves and other wildlife. We couldn’t do it without you! Earlier this month, the Wolf Plan stakeholder group had a conference call/webinar to continue discussions about non-lethal conflict deterrence plans. For those keeping close watch, that’s the third interaction the group has had since negotiations started in August. As expected, progress isn’t always a straight line, and sometimes it can feel like “two steps forward, one step backwards”, but Oregon Wild is committed to ensuring our wolves get a Plan that prioritizes non-lethal methods first. Our next meeting is scheduled for November 27th in Pendleton. Long time Oregon Wild member and volunteer, Alan Hirschmugl, had a unique opportunity this month to assist a livestock operator in southern Oregon do a little, shall we call it ‘house cleaning’. Ted Birdseye, a rancher just outside Prospect, has been in the news lately for livestock and dog predation by the Rogue pack. Ted, in collaboration with US Fish and Wildlife Service, ODFW, and a few volunteers organized a bone pile cleanup to remove any attractants from the surrounding land. Here’s Alan’s download of the day’s event. Thanks to Alan and others for their willingness to get their hands dirty. As our Northeast Field Coordinator, Rob Klavins can attest, sometimes we get epic shots of wildlife on our trail cameras in Wallowa County, and other times, just 500 pictures of cattle. **Sad face**. For our friends at Defenders of Wildlife and Cascadia Wild, they were fortunate enough to snap some rare photos of the newest residents on Mt. Hood. It’s nice to see the White River wolves getting settled in their new home. We can only hope this is a sign that more wolves will be dispersing from Northeast Oregon to other parts of their historic range. 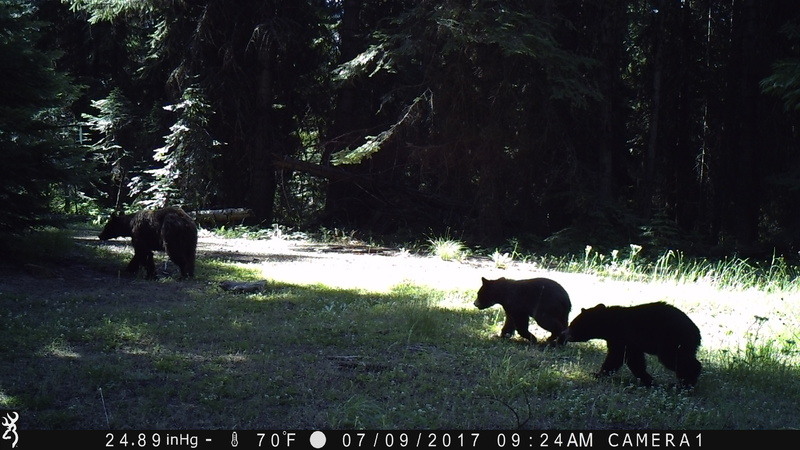 Photos of a black bear family in Wallowa County taken by Oregon Wild's trail camera. Wildlife can’t vote, but pro-wildlife people can and did! At least in Oregon, the public overwhelmingly supported incumbents and candidates who care about conservation. That’s great news! And in case you missed it, Oregon Wild hosted a post election roundtable discussion to talk about what the elections could mean for wildlands, wildlife and waters. For those who prefer to read the analysis, it’s also in a blog form. Now that Governor Kate Brown won re-election, Oregon Wild and our allies in conservation can continue conversations with her office about appointing non-biased, scientifically-minded individuals to the Fish and Wildlife Commission. This Commission holds a lot of power in determining the fate of our state’s native species. Commissioner Bob Webber is officially termed out and earlier this year Commissioner Laura Anderson stepped down. Those two, in addition to two more seats (Chair Mike Finley and Commissioner Holly Akenson) will be open next year. It’s critical that the Governor focus on appointing individuals who will represent broad public values, not be shills for industry and other special interests. There will be opportunities for you to weigh in, so please stay tuned for updates and action items. And in other good post election news, Congressman Rob Bishop R-Utah, Chair of the House Natural Resources Committee, will have to hand his gavel over to Congressman Raul Grijalva D-New Mexico. Representative Grijalva hasn’t just been a champion for wildlife, public lands, and protection of the Endangered Species Act, but an advocate and ally. Needless to say, we’re quite stoked for the change in leadership. However, until then, we’ll be vigilantly watching any attempts by Bishop to pass abhorrent bills that undermine our bedrock environmental laws during the lame duck session. Once Grijalva becomes Chair of the House Natural Resources Committee, one of his first priorities may be investigating Interior Secretary Zinke. Is ODFW spreading fake news about cougars? Check out this OPB story on recent discoveries about how ODFW conducts cougar population counts, management decisions, and more. Bill Ripple, scientist at OSU who is best known for his research on trophic cascades and wolves, was recently interviewed by KGW to explain the positive effect wolves have had in Yellowstone National Park since their reintroduction. Wolves surely do change rivers! And finally, Wildlife Program Coordinator, Danielle Moser, talks to NW News Network about a possible reintroduction of sea otters to Oregon’s coast. Oregon Wild will be organizing a wildlife lobby day in Salem on Thursday, February 21st. This will be an opportunity to meet with your state elected officials about wolves, Fish and Wildlife Commission appointments, and more. If there’s one thing that is certain: legislators need to hear from their constituents about issues that matter to them. We hope to see you there! Stay tuned for more details in the coming weeks.